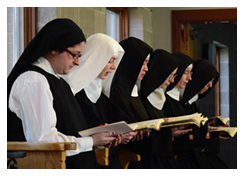 Dwelling in the heart of the Church, the Bride of Christ, cloistered nuns have the special vocation of remaining in constant dialogue with God. 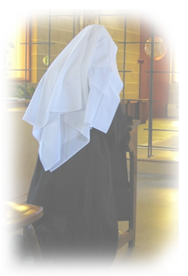 It is particularly in Holy Mass and the Divine Office that our prayer finds its source and highest expression and around which the daily schedule revolves. Eight times a day, the bell calls us to the “Work of God” and we chant psalms, hymns, readings, and prayers according to the arrangement determined by Saint Benedict in his Rule. The Divine Office is both a service and a school where we enter into the very words and sentiments inspired by God himself. For this reason, it has a universal and timeless character making it fit to touch the heart of God and address every human need. 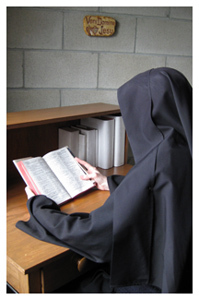 For the nun herself, the word of God instructs and nourishes private prayer and all her daily activities. 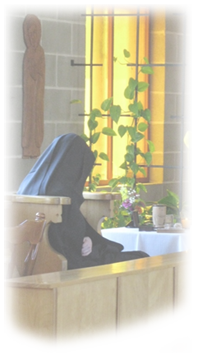 The most favorable hours of the day, apart from the Divine Office, are reserved for Lectio Divina, or the prayerful reading of Holy Scripture, the Church Fathers, and the doctrines and lives of the saints.